The Centers for Disease Control reports that among children ages 1 to 4, drowning is the leading cause of death due to injury. With summer just about in full swing, here are some tips that will help keep your child safe around the swimming pool so that you do not have to take an unexpected trip to your nearest emergency medical facility. Having an adult to supervise children at all times when they are in or near a pool is vital to helping ensure their safety. If there are any infants or toddlers in the pool, an adult must be in the water with them, always at arm’s reach. Even if the children are older, adults still need to be nearby. You must not be distracted while supervising; turn off the phone, do not take care of household chores, and definitely do not drink alcohol. You need to establish pool rules and make sure they are strictly followed. For example, do not allow any toys near the pool when the pool is not being used and empty all blow-up toys once everyone is done swimming. Also, do not allow any tricycles or bicycles at poolside and keep all electrical appliances at a safe distance. Make sure no one runs on the pool deck or dives in a pool that is not deep enough. It is very easy for a small child to get to a pool that is not surrounded by a protective fence. Children can get through a doggy door, through a window or through a door that has been cracked open. Fences need to be climb-resistant, without any type of furniture of other item nearby that could be used to help a child get over. They also need to be at least four feet high with no more than four inches of space between the slats. Gates should self-latch, self-close and be well maintained, and should only open away from a pool. The latch should be at least 54 inches from the bottom of the gate so that small children cannot open it. Tragically, many children die because they swam too closely to a pool drain or filter and were trapped by the suction. Keep all swimmers away from these areas to eliminate the chances they will be harmed. 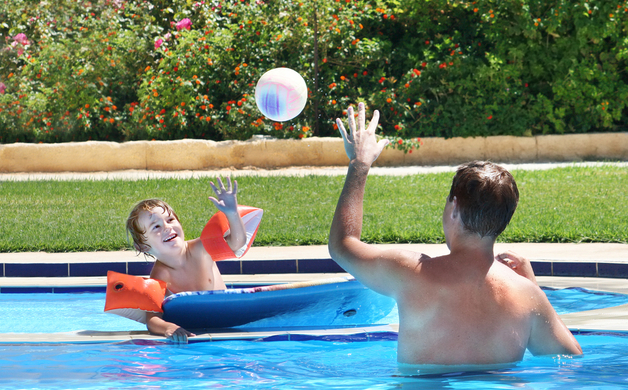 By following just a few basic safety precautions, you can make sure everyone stays protected and still has a great time in the pool this summer. This entry was posted in pool safety on June 23, 2015 by admin. Aluminum fence is priced according to the ornamental design and grade of fencing you choose. Residential fencing is less expensive and requires a lighter gauge then commercial or industrial aluminum fence do. This entry was posted in aluminum fencing, Aluminum Gates, metal fences and tagged aluminum driveway gate, aluminum driveway gates, aluminum fence, Aluminum fences, aluminum fencing, aluminum gates, aluminum pool fence, aluminum pool fences, aluminum pool fencing, aluminum swimming pool fence on June 15, 2015 by admin. When you plan to install a fence around the perimeter of your yard or swimming pool there are a variety of options to consider. Out of the vast array of options the most popular material in fencing continues to be aluminum. When you look at all of the options on the market and compare the benefits of aluminum over other materials you will see why it continues to be the number one selling material in fencing. Aluminum fencing is a preferred option in fencing for the many benefits it offers to homeowners. Below you will find a list of the advantageous that aluminum offers over wood, vinyl, chain link, wrought iron and other fence materials. Minimal Cleaning and Maintenance: The prime advantage that aluminum has over other materials in fencing is the lack of time and money you will spend on the upkeep. Aluminum fence does not require special cleaning or maintenance. In order to keep your fence in the same shape as the day that it was installed all that is required is a light power washing every once in a while when dirt, algae or moss starts to grow. Huge Selection of Styles: Ornamental aluminum fencing comes in so many variations. Whether you are looking for something simple or something decorative there is a style that will compliment the exterior of your home. Decorative finials add a historical look while circles appear modern; depending on what you desire there are features you can add to create the perfect combination for your yard or pool area. Resistant To Corrosion: Aluminum fencing is resistant to corrosion. Once the fence is installed the metal is prepared in such a way that it preserves the natural shine for a long period of time. Often times the aluminum is powder-coated which offers a smooth finish to the surface of the fence. You can purchase aluminum fencing in a variety of colors therefore it never will need to be painted. Easy Installation: The installation of aluminum fence panels is just another reason this material is chosen often for perimeter fencing. Being that you can install aluminum fence on your own in a weekend, it is that easy, it saves homeowners a great deal of money in installation. If you are not a do it yourselfer finding a fence installer will be simple. Aluminum fencing is also easy to repair, durable, light-weight and competitive in price as well. The benefits of choosing aluminum are abundant therefore making it a continued favorite for homeowners. This entry was posted in aluminum fencing, metal fences, pool safety and tagged aluminum driveway gate, aluminum driveway gates, aluminum fence, Aluminum fences, aluminum fencing, aluminum gates, aluminum pool fence, aluminum pool fences, aluminum pool fencing, aluminum swimming pool fence on June 8, 2015 by admin. It is almost impossible to picture a deck without railings. Railings are in place not only to create an aesthetically pleasing architectural addition but also to provide support for unsteady people as well as to add an extra barrier of protection for children and pets. As you begin shopping for railings for your deck you will find the market is flooded with a variety of styles and materials to choose from. It is easy to be confused when it comes to different railing systems available within today’s market. Following the tips below you will better be prepared to make a decision on what railings and hand rails are best for your home and situation. Determine a Reasonable Budget: Coming up with a reasonable budget is where every home improvement project should begin. Take into account what you can afford and how much you are willing to devote to your project. As you determine a budget consider the durability and maintenance of the product you choose and wok those figures into the extended budget. The cost of aluminum railings upfront may be a bit more but overtime when you consider the time and costs associated with maintaining wood it may be that aluminum rails and hand rails are the better value. Consider the Variety of Materials Available On the Market: Railing for your decking comes in a variety of materials; varieties include aluminum, vinyl, wood, iron and glass. For a durable, attractive, versatile and practically maintenance free material we suggest you look into aluminum railing systems over other materials on the market. Wood is prone to decay and requires yearly upkeep which can be a financial drain year after year. Glass is a trendy option that is difficult to keep looking fresh and clean. Iron is incredibly durable but is heavy and more difficult to install. Vinyl is a good choice but again is not nearly as durable or maintenance free as aluminum. Consider Local Regulations: It is necessary to check with local ordinances on rules and regulations of deck railings in your area. Depending on the height of your deck the railing will need to be a specific height. Not only should you consider the height of the railing system but also the width of the space between each rail. All of these are important measurements to obtain before ordering your aluminum railing to ensure you are ordering railing that meets the residential code criteria. Choose a Color and Style: Choosing a color and style of railing can often be one of the more difficult choices. Many homeowners need to visually see what the combination will look like with the style of their home before committing. Many online companies offer design studios that allow you to import a picture of your home and design the space with a variety of aluminum railings. This allows you to visualize different colors and styles before you commit. These tools are terrific to compare between several styles you are considering. The final decision is yours. It will come down to your personal taste and desires. Some homeowners choose a complementary style that matches the home while others desire a stark contrast between the two. While one person likes simplistic designs others may enjoy the ornamental aluminum styles. Take time while choosing your aluminum railing as it is an investment that will be last for decades to come. This entry was posted in Aluminum Deck Railing, aluminum fencing and tagged aluminum driveway gate, aluminum driveway gates, aluminum fence, Aluminum fences, aluminum fencing, aluminum gates, aluminum pool fence, aluminum pool fences, aluminum pool fencing, aluminum swimming pool fence on June 2, 2015 by admin.